Our first visit to Madeira was for our Honeymoon 30+ years ago and we have been returning ever since. It was our visit At Christmas 2014 when we found the house and are extremely happy to share it with you. We live in the UK, have one Son and are both working professionals. We have been travelling to Madeira for over 30 years and have taken great care to obtain a property which suits the high expectations of visitors to Madeira. We wanted a property where we could watch the cruise ships and fire works and had undisturbed views of the sea. These requirements limited our available search to the one road (Rue do Lazareto ) which we were rewarded with finally found a house on completing in June 2015. It was watching the cruise ships on New Years eve from the terrace which convinced us that this was the right property for us. We had been searching in this area for many years and the view sealed the deal ! We have just returned having spent 2 weeks watching the dolphins playing in the sea, a magical breakfast experience. Quality bedding is provided with additional blankets should they be required. All beds have mattress covers, pillow protectors, duvets and throws. Dressing Gowns available in all bedrooms. There is a garage located underneath the house. Please let us know if this is required so a fob can be provided. Extensive range of crockery, Glasses and utensils, provided for 6 people, Larger settings available. There is dining for 6 people both indoors and outdoors. Small area which has fresh herbs and strawberries - Please PYO when available. 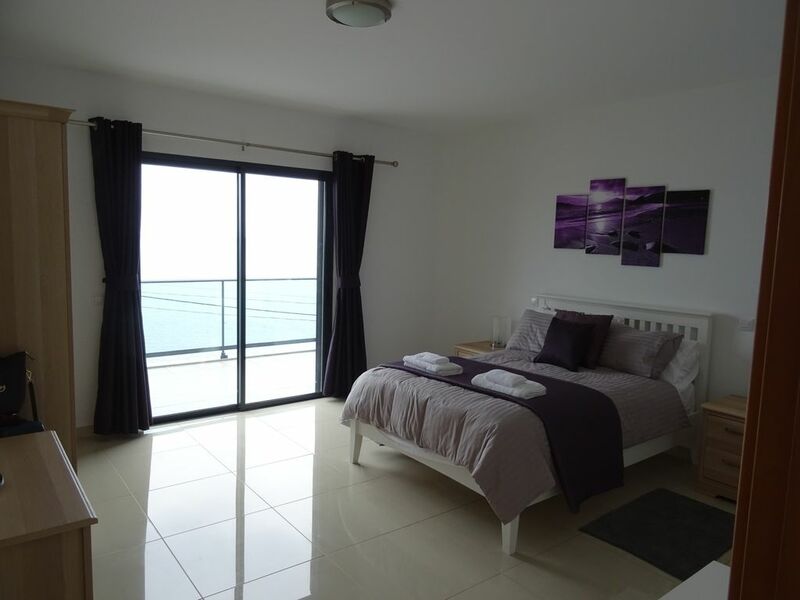 Ideally situated close to the old town, super views overlooking the sea, a kitchen better equipped than our own at home. There is plenty of room for 6 adults in ensuite bedrooms and spotlessly clean. Mirela who looks after the property couldn't have been more helpful and Rafael the taxi driver was great too!! Mike and Karen have the perfect holiday home. Amazing, do not miss the chance to stay here! Thank you for taking the time write a review. It means a lot to us that you had a great time and are looking to return in the near future. We are very proud of our team and their commitment to maintaining the high standards expected by our guests. Looking forward to welcoming you back soon. Brilliant villa, brilliant location ! Karen and Mike are great owners with really good communications and information. Finding the villa was easy and we were welcomed by Mirela who was very helpful throughout. The garage is perfect (plenty of room for even a large car), as parking is difficult given the villas close vicinity to the centre of Funchal. The villa is in a quite location with great sea views. It is very modern, clean and well equipped with comfy beds and inside/outside furniture. The location means that it is only a few minutes walk to the nearest cafe and many good restaurants, with the town centre a few minutes further. We would definitely return to this villa and would highly recommend it. Thank you for your review and are pleased you enjoyed your stay. We look forward to welcoming you back in the future. Kare, Mike and Mirela. The villa and the service given by the owners surpassed our expectations. The photos don’t do it justice as it is even more stunning! Fantastic location and every possible thing you might need is supplied and all at a very high level of quality. We would thoroughly recommend this beautiful villa. We are so pleased you enjoyed the villa and it exceeded your expectations. Our aim is always to make our guests feel welcome and are constantly striving to add the little details which make things easier or more comfortable. Thank you for your feedback on the photos we will have a think about how we can improve them. We hope to welcome you as our guests again should you wish to return to Madeira. Karen and Mike. If you go to Funchal, live here! This is a house with everything in place. Lovely view, good spacious rooms, walking distance to all the restaurants you need. Perfect terraces. Mirela and Rafael helps you and drives you whereever you want to go. Perfect hjelper to the owners, Karen and Mike. Greetings from the six of us. Thanks. Thank you for such positive feedback, we are pleased that you enjoyed your stay and appreciated the thought that we put in to try to make you stay a pleasure. Karen mike and the team.